The bromeliad plant is slated to be one of the trendiest plants of 2017. 2017 is upon us and as we ramp up to stick to our resolutions, we are also excited to see which trend predictions will win out this year. From the hottest wedding trends to the most inspirational garden planning, we anticipate 2017 to be a great year with some bright and innovative ideas. As we mentioned before, Pantone recently released their color of the year, Greenery, for 2017 and it looks like floral trends may also be following this color and style. 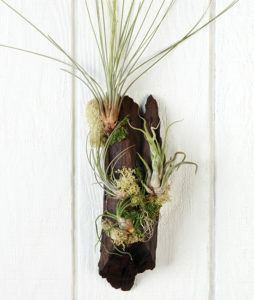 The air plant, a cousin to the bromeliad, has been a hot item for years with its easygoing nature and impressive look. As we begin to see what 2017 brings, one flower that is due for its heyday is the bromeliad. Bromeliad flowers and plants are a continuation of a trend that hit the previous years: the air plant. The bromeliad flower is part of the Guzmania family and are cousins to the air plant. Sturdy and hearty yet undeniably eye-catching, air plants have been popular for several years for their aesthetic as well as their easygoing nature. The bromeliad and air plant family comes from tropical, warm regions of the world, making them tolerant to a diverse range of care and environments. 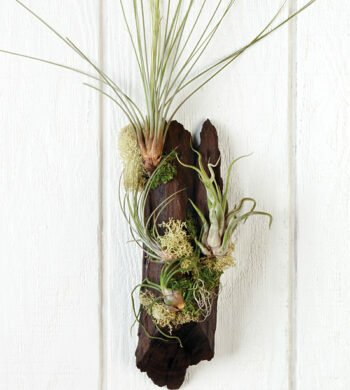 For example, our Mystical Simplicity Air Plant only requires occasional misting yet look intriguing hung on a wall. Our Little Havana Bromeliad Garden features three varieties for a multitude of textures and hues. However, bromeliads differ from the ever-popular air plant as bromeliads’ brightly colored blooms come in rich, tropical hues and their blooms are larger and more textural than air plants. Greenery’s brilliant shade of green plays into the scheme and popularity of the bromeliad as it looks like we are moving toward more saturated colors and larger, showier plants and blooms. 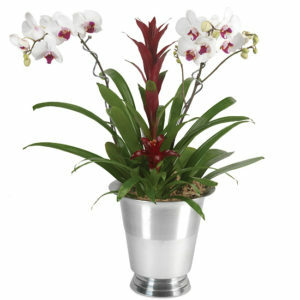 Adding a splash of color with an impressive plant to home or office décor is sure to lighten up a room and moods. Bright colors have great mental health benefits and what’s not to like about that? A Little Havana Bromeliad Garden can achieve both these things for you. 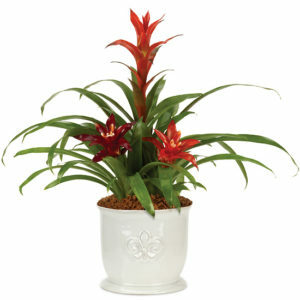 The white ceramic planter is the perfect foil to let the bromeliad flowers take center stage. This garden style planter makes for a great bromeliad house plant as it features three different tropical bromeliads so you can see a diverse range of blooms. Place it in an office for an extra boost of focus or to add color, warmth, and vibrancy to your home. A Tropical Elegance Orchid Garden features the beauty of bromeliads paired with orchids. It’ll be interesting to see how bromeliads integrate into current trends as weddings have generally been leaning towards looser bouquets and centerpieces. 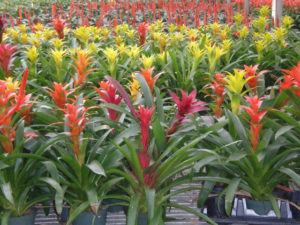 For something a little different, bromeliads add more structure and work well with succulents and other shapely plants. This plays well with more exotic looks and styles. Our Tropical Elegance Orchid is fitting for this particular look as it combines two colorful bromeliads with two Phalaenopsis orchids to create a lush garden, reminiscent of the tropics. This would make a wonderful addition to a wedding or event as a show stopping centerpiece as it comes in a stylish silver wine chiller. Clearly, bromeliads are a versatile plant that combine beautifully with other varietals, like orchids, and are also striking enough to stand on their own. It will be exciting to see which trend predictions pan out but we are sure the bromeliad plant will have its time in the sun this year. And as the year moves on, and we begin to see bromeliads flowers in spring gardens, summer weddings, and fall planters, we can’t wait to see where this bright and beautiful bloom takes us. 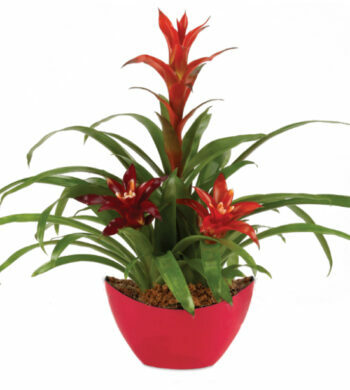 Or, if you want to keep up with trends all year, our Year of Tropicals is also a great option. Not only will you receive a bromeliad during the year, you will also be introduced to 11 other great tropical plant varieties for you to find your new favorite. And who knows, maybe start the newest trend in the seasons to come!